It may seem like something for a professional, but if you are capable of simple car maintenance (changing oil, changing windshield wipers, etc. ), then you are capable of starting your own electric vehicle conversion project. You will need a knowledge base to do so, but you are completely capable. The first step of taking on this project is researching the topic. Complete web searches or browse the local library. Regardless of how you obtain the information, this step is vital in completing your new electric vehicle (EV). Ready everything you can on this topic and absorb as much information as possible. 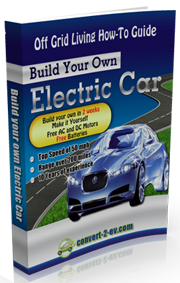 Next you will want to find yourself a mentor or someone who has already built an electric car to assist in the project. This may not be easy, but may be vital to the project. With someone there who is experienced, you will have a source of knowledge readily available. A great place to search for a mentor is by joining your local Electric Auto Association. Once you have a mentor and some knowledge, you will now need to find a donor car. This could be any car, just as long as it is light. The lighter the better. You can pay for this vehicle or look for a donation or junker. Mechanically, it should work but the motor will not be needed. You will likely be ripping the majority of the components out anyways. A great idea, when building your own electric car, is to purchase an electric vehicle conversion kit. This will assist in converting the old drive train into an electric alternative. The conversion kit is a much more efficient way to complete the task, rather than converting everything from scratch. That is why it is called a “kit.” Machining parts will be required in order to complete this build. So, unless you are a machinist, you had better find one who has the appropriate tools to complete precision work. Some parts, such as the transmission adapter plate and the part which connects the motor to the transmission must fit precisely. Without a precise fit, it is likely that your conversion will last about as long as a gallon of gas in a V8. Now it is time to remove that old gas hog, called an engine. You could do this yourself, but auto repair shops have the hoists, knowledge, and employees to do it for just a few hundred dollars. This is a great idea for quick work and less hassle. Consider it, but either way, you have to get that motor out of there. You are just about ready to start the conversion process. You want to make sure though, that you have a clean, dry, and warm place to work. You will have to dedicate a bit of time in this place, so make sure you have the area reserved. This means, you shouldn’t be doing this in the wife’s garage if she wants to pull the Bug into it. Although the process can be very direct, you may be waiting in between getting parts or fine tuning something. So, the area that you work in should be dedicated to the build until it is done. You will need plenty of space to remove old parts and organize new parts. A schedule should be created for your parts delivery. Your mentor will be a prized possession in this case, as they have experience and will be able to help you break the build down into more reasonable tasks. Looking at the project as a whole may be a little over bearing, but working on small individual tasks will help with the work flow and keep your better organized. The exception to this rule, however, is if you have purchased a complete electric vehicle conversion kit, as you cannot order half of the kit. The kit will contain every part required to complete the job. Use available resources during the build. Your mentor may not be able to assist with every snag you run into. You should continue researching this topic indefinitely until you completely understand the process as well as issues which may come up during the transition. The internet is a great source of knowledge, between educational resources and forums. Just keep in mind, not all forum members are the “know all car gods” that they claim to be. You can learn a lot from them though. Document your progression. This can be done by taking video or pictures. You could keep a blog about the process or simply write a tutorial. Keep in mind, the vital information is when everything didn’t turn out exactly as planned. This allows for knowledge and troubleshooting. Even though it can be embarrassing sometimes to admit that you screwed up, it will almost definitely help someone else if posted online for public viewing. This will allow others to learn from your mistakes. Don’t forget, you are receiving the help from a mentor. By documenting your process, you may be able to help others and without this type of support group, the process could be very difficult. Don’t forget to have fun with this project and be proud that you are joining an elite group of people who have pursued the right to harness raw energy from electricity. This is putting great use to electricity and allows for travel with fewer emissions. You could take on this project to be “green” or simply to challenge yourself. Interesting piece and I shall pursue. This is a new field for me and I have a lot to learn. I see in the top photo what looks like TWO electric motors mounted onto the one transmission. Or is it one motor, one generator (for braking)? I’m wondering if its two motors to drive one shaft then is that how you can build up the power – as most motors I’ve found are not sufficient to drive the weight of car I want to convert. If not – perhaps put me in the picture!